Well, autumn has almost arrived in Israel, beginning with powerful thunderstorms last week leaving pools of water for me to sludge through on my way home from Jerusalem. It is still sandal season this week, but at last I am in need of a sweater and jeans. I have not been at the easel often recently, for exciting reasons I will share soon, but I was able to work on this painting sketch above (50 x 65 cm). 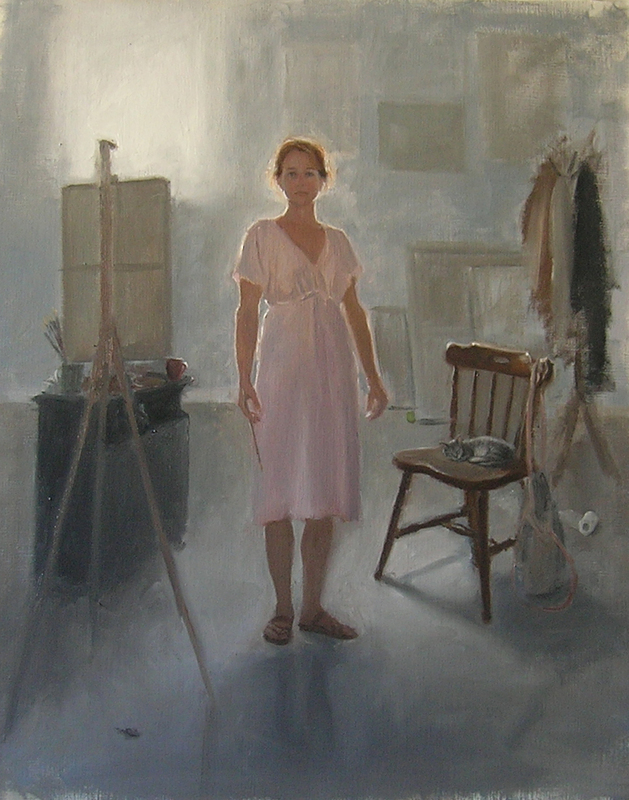 My intent was not to do another self-portrait (I still have no grasp of Hebrew to approach people for model requests), but rather to focus on the backlighting scheme, how everything is painted gray at first, belongs within tones of gray and only lines of light delineate the elements in the painting. Sadly, this photograph shows more contrast than seeing the original. I don’t tend to like “obvious” paintings, the ones where you know instantaneously what you are looking at. I prefer putting important elements in the shadow, elevating something apparently plain by rendering it more fully, alluding to the absence of someone or something. I guess I just like to make paintings that you can only understand more fully if you look at it more slowly. I have some tremendous inspiration for an upcoming set of painting series, which will focus on my love of, and educational background in, humanism. Some will be dark, others outdoors, and for still others I will need a ladder. I have a few model “victims” in mind other than me and my cat, and I look forward to beginning them, to seeing where this melding of knowledge, memory, and in-depth observation will lead.